If you don't have access to Amazon DataFeed FTP, you can import your data in Strackr easily. 3. 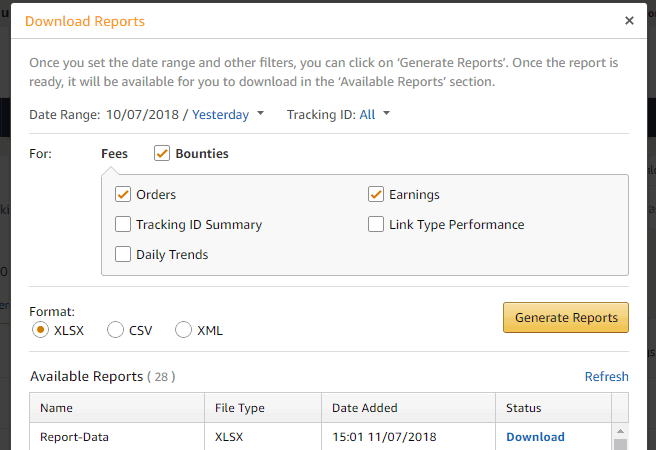 On Amazon affiliate dashboard, go to Reports, then click on Download Reports on top left, select your Date range and click Generate Reports, wait few seconds and download your ZIP file. Important: Orders, Earnings and XSLS have to be checked. 4. Drag and drop the ZIP file and click to import, wait 1 or 2 minutes and your data will be available on Strackr.